Looking for the perfect gifts for loved-ones while in the Eugene area? 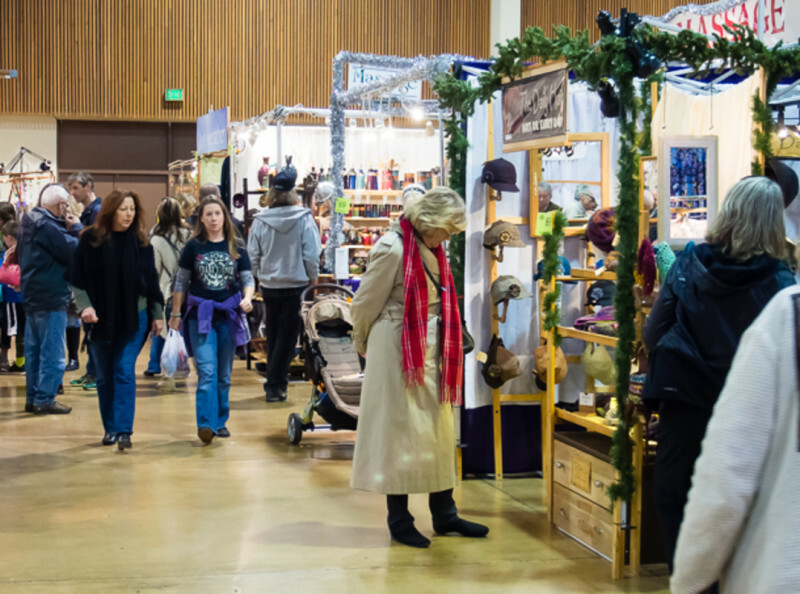 Get in the holiday spirit at Eugene’s Holiday Market! The Holiday Market is home to over 250 vendors of unique hand-crafted goods on weekends from November through Christmas Eve. Live music and entertainment keep the space filled with cheer as you wander the market. Go with the flow or grab a directory with a map to find the perfect item quickly. Bring the whole family and enjoy the special entertainment for kids every morning at 10:30 a.m. With many booths and rotating performances, you might just find yourself here all day. For when you get hungry, the market has an International Food Court full of delicious options. Once you've found that perfect for gift in everyone in the family, put your feet up beside the fire at one of the many South Willamette Valley wineries. Buy a bottle as a gift or just reward yourself for finishing all of your holiday shopping. During your south valley stay, also make a stop at the Christmas at The Village Green in Cottage Grove. For the holiday season the Village Green Resort & Gardens decks their gardens in thousands of twinkling lights. Stroll the grounds, warm yourself by the outdoor fire pits and enjoy the festive atmosphere. This year, they are doubling the number of lights to over half a million twinkling bulbs! Thursdays through Sundays, peruse a traditional Christmas market modeled after European Christmas markets, known as "Weihnachtsmarkt" in Germany and Austria. Vendors will be offering German inspired food and drink including bratwurst, baked goods and gluhwein (a German hot spiced wine). Sip on hot cocoa, or for those 21 and over, a warm mug of gluhwein. There is also live music and entertainment from 6:30 - 8 p.m, games to play in the new family lounge overlooking the gardens, and Santa visits from time to time. If you happen to be in the area on Saturday, December 8, reindeer will visit! Want the kids to have something to bring home? Bring along your extra Halloween candy to make a yummy looking gingerbread house with Adventure! Children's Museum. On the night of the winter solstice (December 21st), spruce up your creation with icing snow and holiday lights. Adventure! can help you build a ginger village complete with Tootsie Roll walkways and lollipop lamp posts. All materials plus cocoa or tea are included. Please RSVP by December 17 so enough gingerbread can be on hand for everyone. Check out the special offers available for your visit during the most wonderful time of year in the south valley. Which one of these is going to be your new holiday tradition?